Mazen Naous has a BFA from The Boston Conservatory, an MA from the University of Massachusetts Boston, and a PhD from the University of Massachusetts Amherst. Before coming to UMass, he taught at the College of Staten Island, CUNY, the College of Wooster, and the University of Balamand (Lebanon). 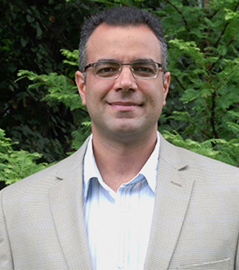 His teaching and research interests include postcolonial literature and theory, Arab American literature, music and literature, classical and modernist Arabic literature, and translation theory. He has published on Arab American fiction, 19th and 20th-century comparative Anglo-Arab poetry, and postcolonial fiction. He is currently working on a book project, titled The Arab American Novel and Traveling Poetics.